We've been talking over and over again about updates for all of our plants, and today we're rounding them up in what we'll call The Mega Plant Update of Spring 2012. Some of these projects, we've been posting about over the past few weeks and in some cases, months — other projects we'll share for the first time, some already have before and after progress pics! Without further ado, let's get started! As we've continued to say, these guys seem to just need time and patience — and that's what we'll continue to give them. 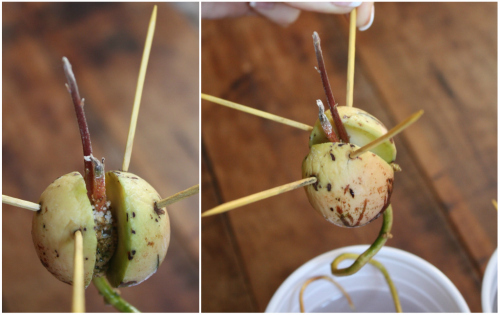 Keep up with our Full Avocado growing Experiment. We've been really pleased with its progress and are debating whether or not to transplant into a larger container to place outdoors at this point. 3. 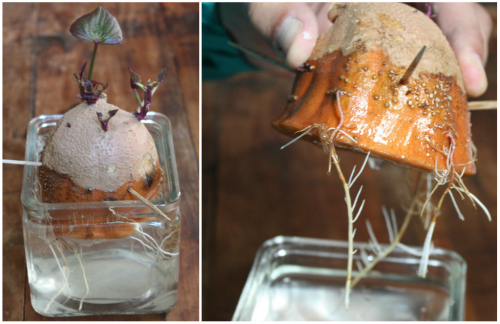 As hoped for, our sweet potato has sprouted both generous root systems and several purple vine sprouts from its eyes that have even formed leaves. 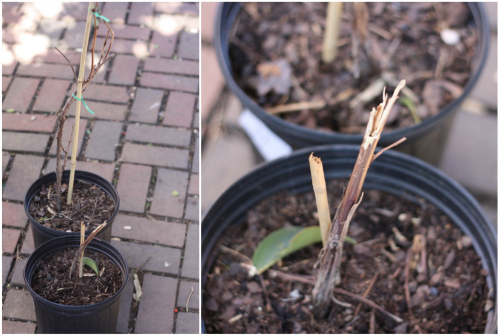 Once the vine stems (or slips) reach about 5-6 inches, we'll twist them off and try to root them into their own potato plants. We'll keep you posted! 4. 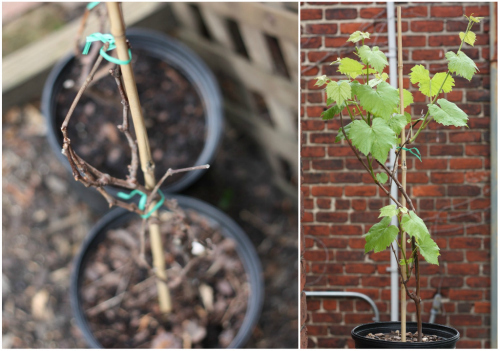 Our Grapevines have gone from beautiful bark to new growth, leaves, flowers and even baby grapes! 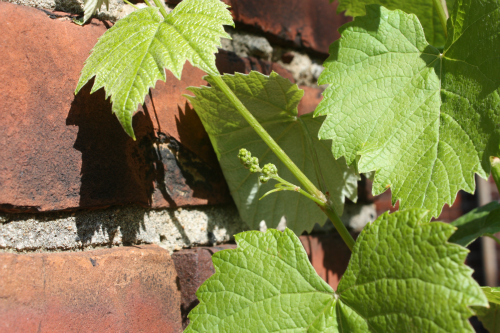 We've been really impressed with the vine growth on this plant. We've also actually since pinched off the mini grape bunches from the plant in order to strengthen the base root for a better produce next year. Basically, the fruit takes most of the energy from plants to sustain, so pinching off flowers and fruits as they form can actually help the plant refocus all that energy back into the main stem system. We hear this is one of those plants (like strawberries) where a little patience and pinching can really pay off down the line. The one Basil destroyed is still looking exactly the same with no new growth, but we're still hanging onto it in the event it's just recuperating for next year. Who knows. 5. 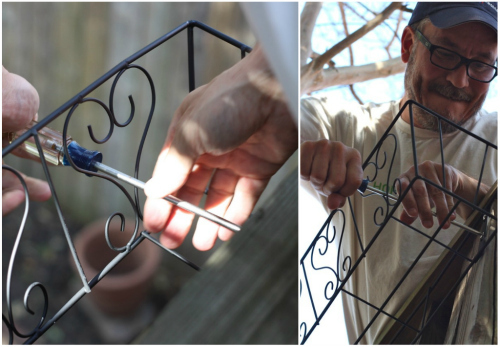 The herb planters we mentioned in this post have since sprouted and are beginning to take shape. From front to back we've got sage, rosemary and thyme making their way into a mix of french herbs for our future cooking. 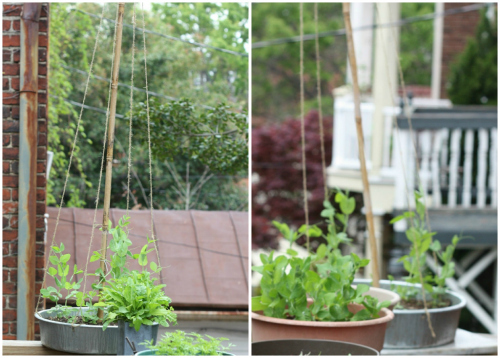 As they continue to grow taller, we simply help guide them up and along the twine and they just grab right on. 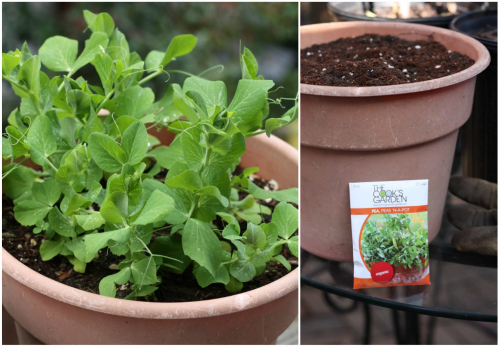 We had also planted a container full of "peas in a pot" — a special hybrid made especially for growing peas in, you guessed it, a pot. These guys have already begun to flower, so we'll be seeing some pea-pods in this container shortly. Tim's already got plans for them up his sleeve. 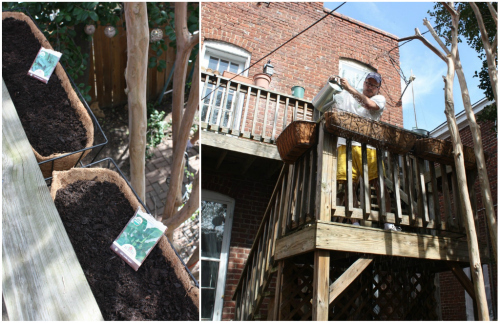 Now for a few new garden & planting updates we haven't yet mentioned here on the blog! 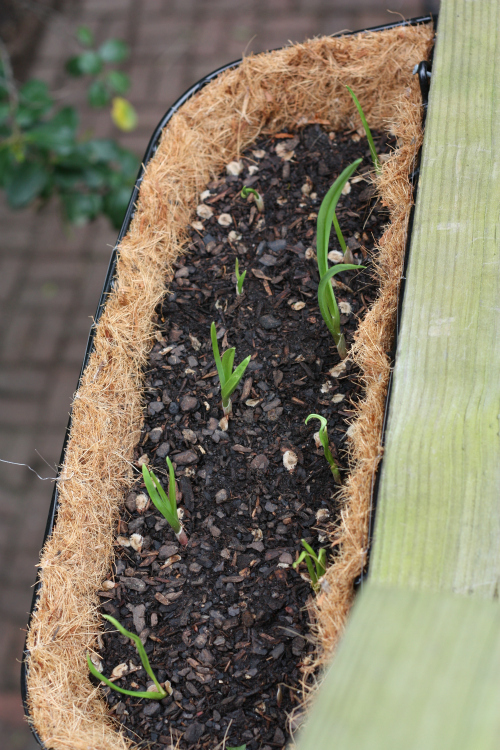 Since we've successfully planted garlic cloves in the past, we figured it would be worth a try even though it technically isn't the correct season for planting garlic (those first garlic cloves are still in the ground doing their thing at the other house). 2. 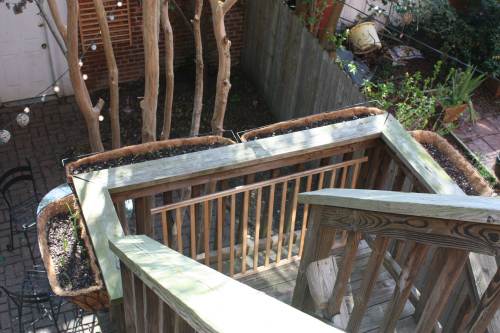 Greens: Tim's been able to install 4 trough style planters across the middle tier of our outdoor staircase. 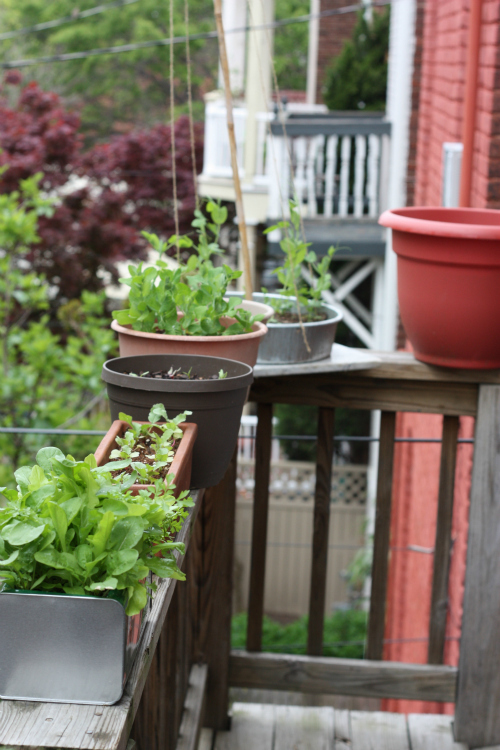 Aside from the garlic you just saw above, the other 3 are housing greens — spinach, arugula & Swiss chard, to be exact. We planted each of these varieties from seed, so coming out each day and watching them sprout has been a lot of fun — we're looking forward to seeing this entire tier filled with greens soon. 3. 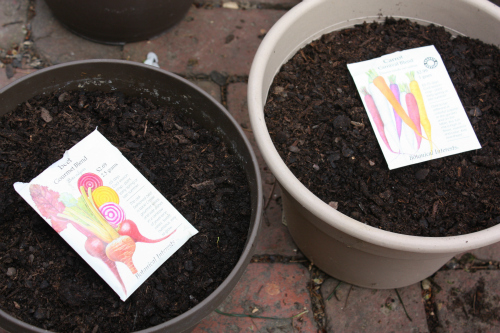 Carrots & Beets: We tossed some colorful varieties of carrots & beets in a couple plastic planters to see what would happen. So far, they've sprouted and we'll soon thin them down. Will be interesting to see what we can get in containers with these guys. 5. 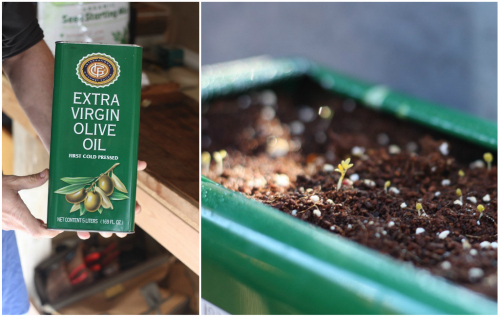 We also planted mesclun greens in a couple containers — one of which used to be an industrial size olive oil can that Tim turned into a planter (find the full diy right here). 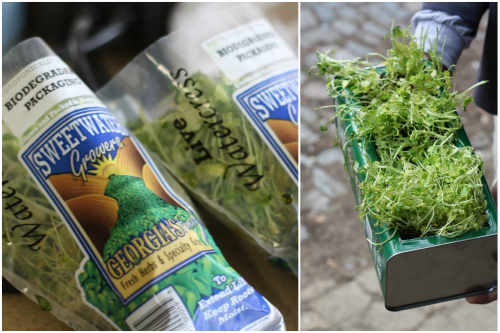 These guys have taken off so quickly that we've already been able to begin making salads from them! As cliche as it sounds, you haven't tasted a fresh salad until you've picked the greens from the garden and brought them in onto your plate. 5. Herbs: we mentioned planting herbs in our front yard last weekend. 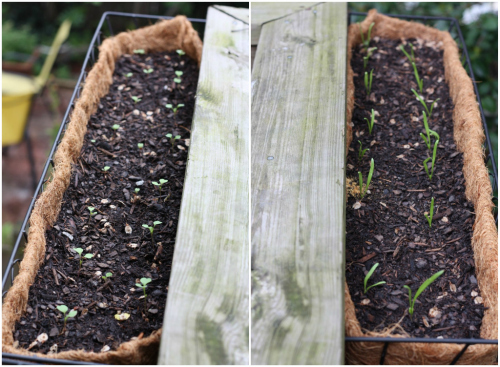 We tossed a few chive seeds in a planter we already had out front and recycled an old wood wine crate we had into a planter where we seeded some basil, dill and move chives. 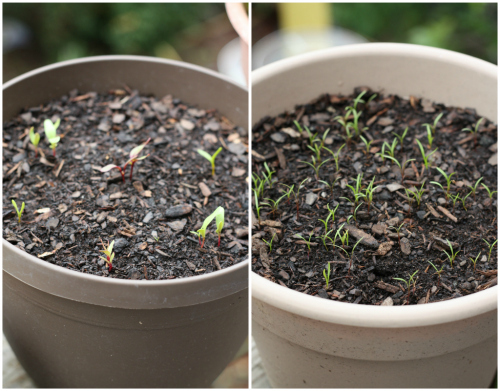 These guys haven't sprouted yet, as you can see from the photos we took over the weekend, but we're keeping an eye out and will be sure to keep you posted. Finally, we're going to show you some of our failures! 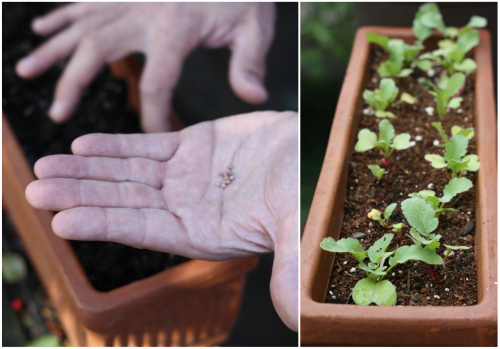 No matter how many successes you have, there are still those black thumb moments! 1. 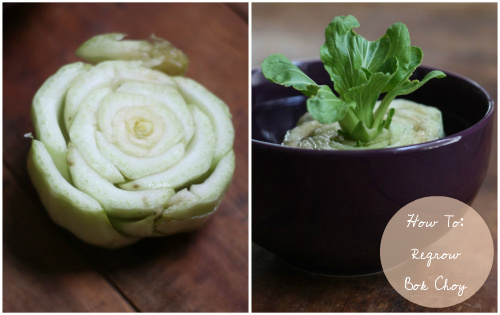 Remember our beautifully re-grown bok choy from the base? Yes — we almost cried (well I did, not Tim). And yes, we will try again! 2. That beautiful olive oil can planter we showed you above has a failure story to it too ( #FAIL). When Tim first made the planter, we tried to plant watercress in it that we'd bought from the store with the roots still on it. 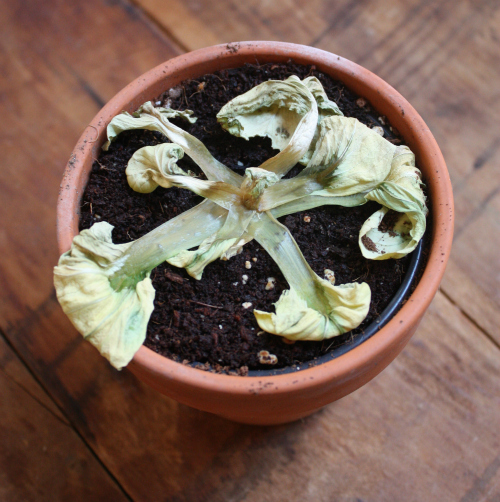 In only a few days they died, too, either from over or under-watering (still not sure). 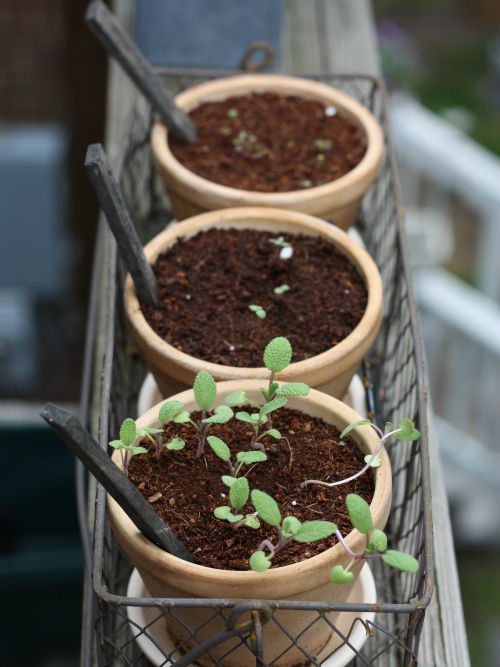 We didn't give up here either and as you could see from above, after planting the mesclun greens, these guys took off! Whew! If you hung in here with us for the duration of The Mega Plant Update of Spring 2012 then you deserve an award. 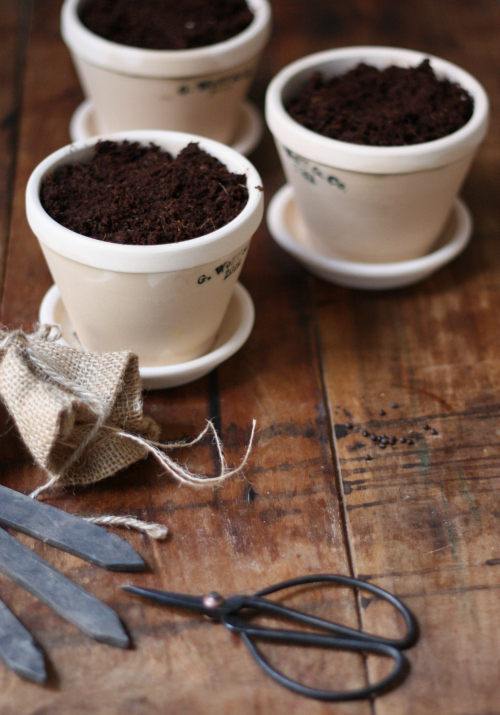 We'd love to know what plants you're undertaking this spring and how it's going! Sabahnur - this is exactly our motto this year! 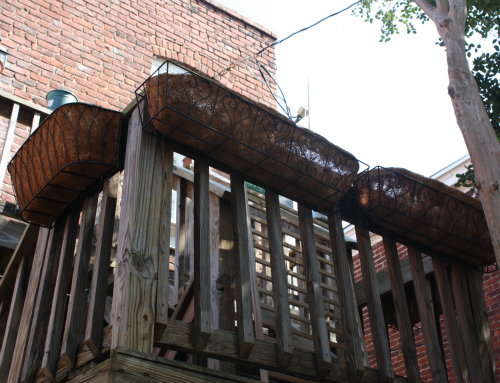 If we don't have the ground space, we are making our own vertical space! 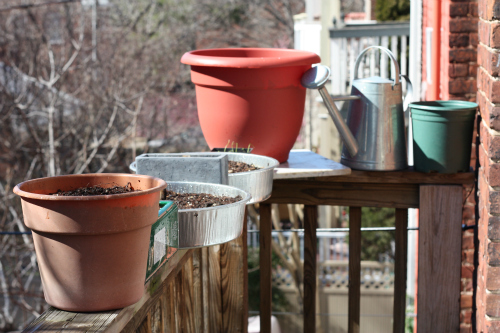 Hoping to "pretty" things up in growing seasons to come, but just trying to get a handle on the growing part as we go. 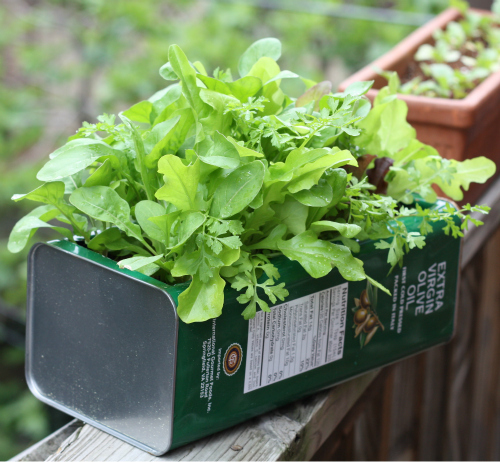 I love all the container gardening. You guys are definitely inspiring me to try some different things this year! Do it, Do it, Do it!! haha, we've had a lot of fun! 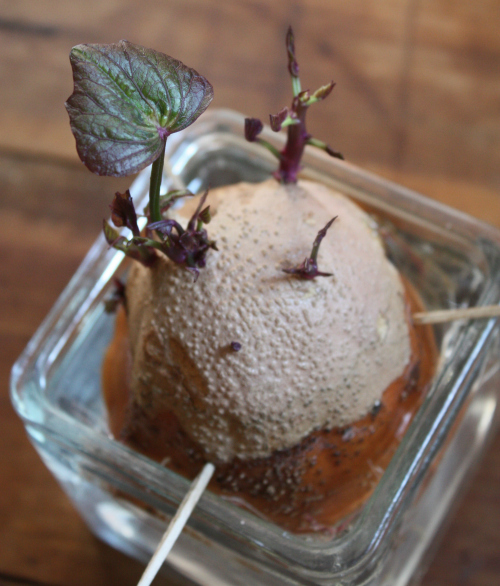 The first photos of the sweet potato eerily remind me of Little Shop of Horrors :) No, seriously all joking aside, I love your planting tips, they are the best. Here's a question, do you have to deal with slugs and snails? Because we live in a rainforest they get the size of snakes up here. No kidding I screamed the first time I came across one. I've been told to leave a bowl of beer out and they will all slide in and die...of intoxication I would imagine. I've not done it because I can't justify giving a perfectly good Alaskan Amber to a slug. Angie that is so funny — we know what you mean on little shop of horrors! We are sure we have slugs & snails but just haven't come across them yet - our neighbors have actually warned us of rats which is why we got that contained composter. Sounds like we need to share a beer at some point! I love all your beautiful growing things!!! Isn't it so much fun? 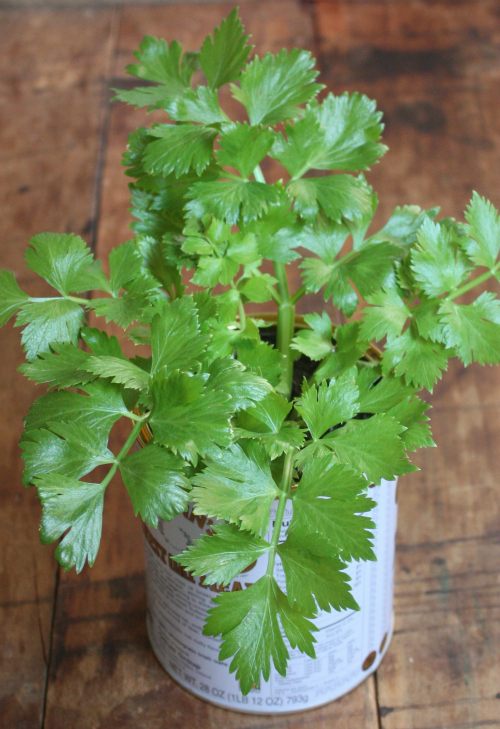 I tried the celery as you showed and have just put it out in my little garden because the middle is sprouting up! 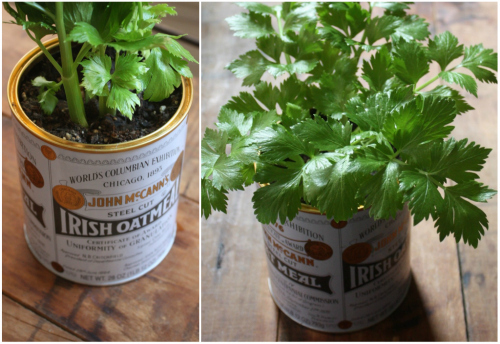 I also am growing some sweet potatoes in coffee cans. I'll periodically show some of my other sprouting things if you wanna take a look. :) The olive oil can was a great idea! Don't we all have plant failures? :) My lavender plant recently got overwatered and a cute little tree i saved from Lowes was doing great, then withered and died. Who knows why. We learn. Please keep updating and telling us what you learn! 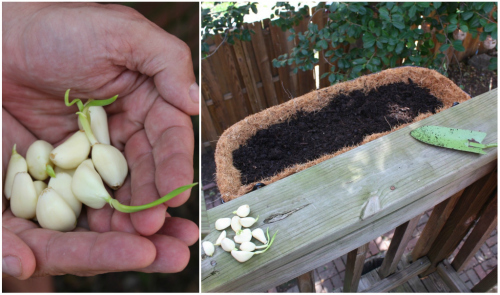 I planted a garlic as well, but how do you know when to harvest it? So thrilled to hear you tried the celery and it's working! 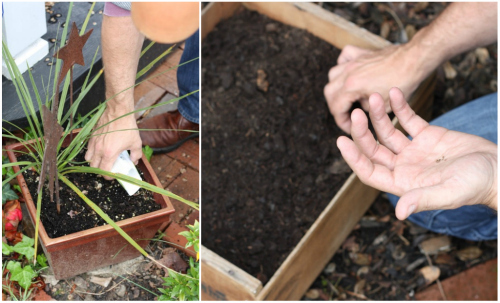 We'll definitely want to see your other plantings, keep us posted if you have time! 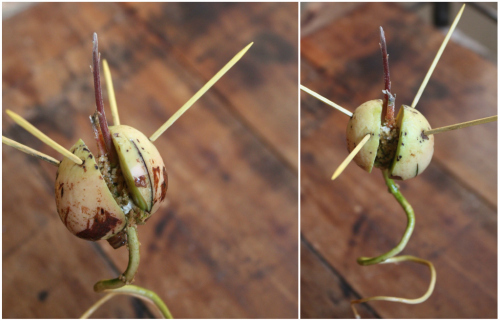 On the garlic there are a few tricks - first it takes a LONG time! You are technically supposed to plant in the fall and not harvest until late summer! We are kindof breaking this rule to see what happens. OK - 1. 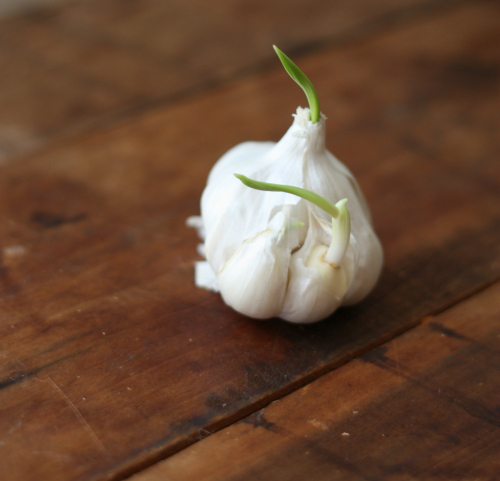 Your garlic will grow super tall and thick, make sure to cut off the center "bolt" stem when it starts to grow up the center of the plant - this will shoot all the nutrients and energy into growing that big bulb you want. 2. When the leaves on the garlic begin to turn brown, it's most likely time to harvest! We haven't gotten to the harvesting stage with either of our plants, but we'll be sure to document when we do! 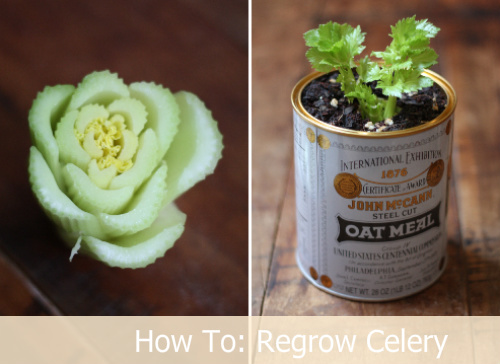 I never knew you could do that with celery, amazing! Thanks for sharing the tips. Thanks for stopping in Jessica! Let us know if you try it! I tried to start a sweet potato and was so disappointed as the part of the sweet potato in the water turned to mush and the rest of the sweet potato was also getting soft. The toothpicks just caved in. I was so bummed! Do you an idea of why? Hey Diane, oh no! I would have been bummed too. Did you cut the potato in half first or put the entire thing in? We saw tutorials for both but went with the cut version. I would also suggest changing out the water every so often to keep things fresh! Sometimes it also just takes time - it took a good week to begin seeing any roots at all and about 5 weeks before we saw good stem sprouts. Keep trying! I tried the sweet potato for the first time a few weeks ago. 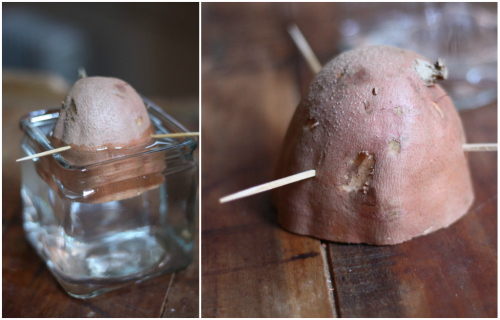 I cut two potatoes in half, put two of the halves in water with toothpicks and the other two in water without toothpicks... there was only one that sprouted w/o toothpicks and one didn't do anything except dry out. 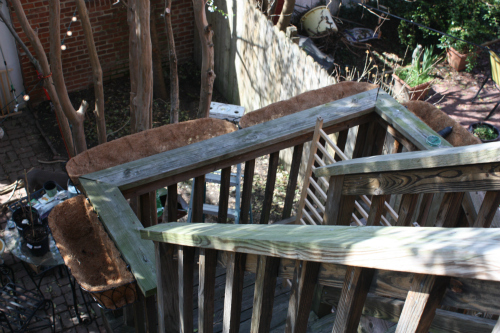 The other two rotted and I had to throw them out ( it was pretty nasty). 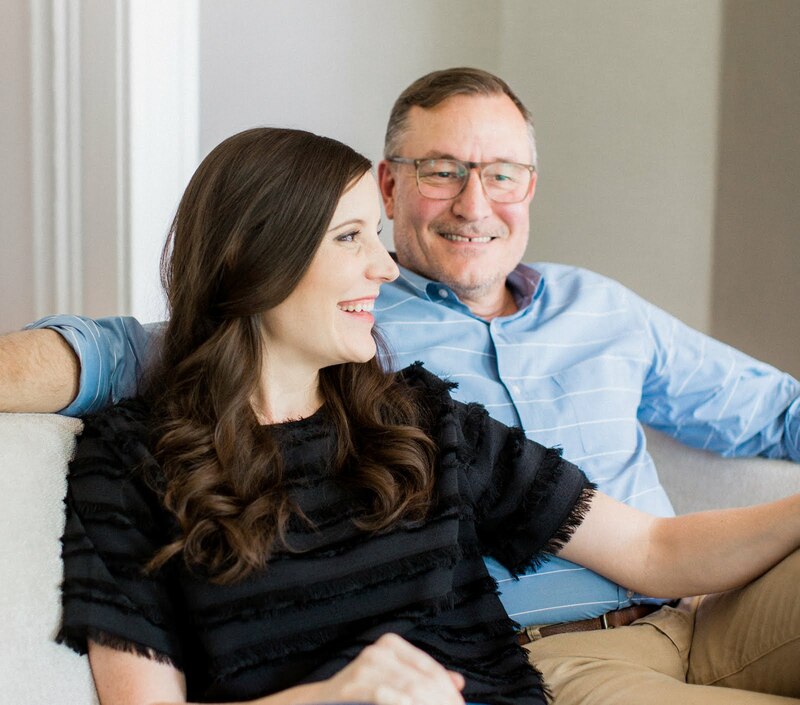 Tim and Mary, thanks so much for all the tips! I look forward to reading more. Wow! Wonderful -just amazing and so inspirational. 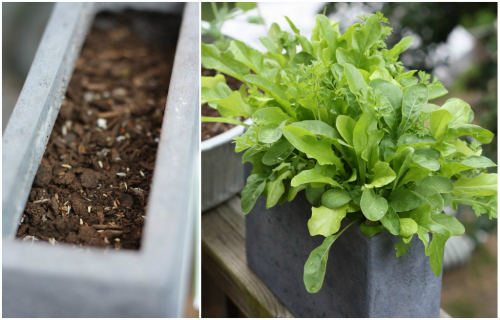 I have had good luck with romaine (cos) lettuce using your celery growing tips. My green onions are very happy as well. Thanks for the great ideas! Vivienne - you have inspired us to try out Romaine lettuce! We have just begun and will soon show pics of our progress, thanks for sharing and continuing to inspire. Any updates on the Romaine lettuce growth?? I'm going to try it out but I'd rather have some guidance from you guys. You have inspired me to start growing a few things. Now if I can only keep my wonderful cats away from it all. Hhhmmmm. So glad you dropped by. 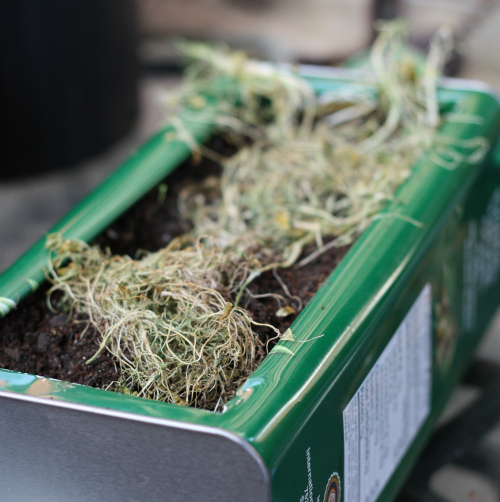 We LOVE you idea for planting in a suitcase, bet that looks incredible. Thanks so much for your kind words, we would absolutely love to see a photo of your window garden and suitcase planter if you have time to send us a picture! The same thing happens to me, every time I buy those herbs from Kroger they die in days- doesn't matter what I do. go ahead and plant some garlic out of season...you can harvest the greens and scapes from them...delicious!! !